A performance at the Metropolitan Theatrical awards in Mexico City. But these days, anxiety over such issues is playing out on both sides of the U.S.-Mexico border, sometimes in unexpected ways. In Mexico City's booming theater scene, a flood of foreign actors with leading roles in major productions has stirred resentment. 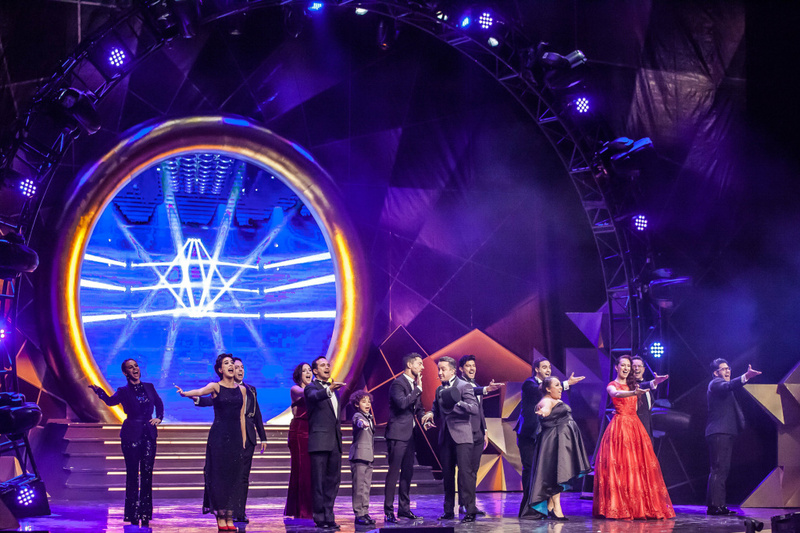 Seven of the 38 nominated actors are foreign, according to Sergio Villegas, the show's organizer, and the country has become a major draw for international theater talent. This is the first year for the awards show, and it underscores just how important Mexico City has become in the theater world. Prominent producers and representatives of the country's president and mayor-elect attended the ceremony, and Mexican comedian star Chumel Torres emceed. In between the award presentations, theater stars performed numbers from the hit Spanish-language productions of Billy Elliot, Grease and Les Misérables. "Mexico is without a doubt the Latino version of Broadway and there are a lot more opportunities here," said Daiana Liparoti, an Argentine actress who received a best actress nomination in a musical for her role as Éponine Thénardier in Les Misérables. She moved to Mexico three years ago because she said the economic crisis in Argentina resulted in major international productions no longer being produced there. The rise of Mexico's theater world is reflected in the cast of Les Misérables. Nearly all of the leading roles are played by foreigners – from Brazil, Argentina and Spain. Liparoti said having a diverse cast is a good thing. "I think it opens the mind, and in this musical in particular – which shows the unity of the people and the town – that's even more true. There are no limits because of language or culture," she said. But the decision to cast mostly foreigners in the leading roles in Les Misérables – as well as other major productions here – has provoked a lot of behind-the-scenes anxiety in Mexico City's theater scene. The musical's casting director went so far as to defend the selection process in a podcast for the theater community. Jerry Velázquez, a well-known Mexican theater actor who stars in the musical Grease, said he felt conflicted about the cast, because the foreign actors are terrific. But he added, "It felt as if we were not enough. As if our country didn't have the people who could do the job." The fact that the foreign actors from Argentina, Brazil and Spain are generally taller and more fair-skinned than the Mexican actors also means they fit the conventional look of a leading role, especially when the production is exported from the United States or Europe. "Probably they could all look Mexican and it would be fine. I wouldn't judge. But I don't know about everyone, and maybe that's the fear with producers," Velázquez said. There is even a term for this phenomenon in Mexico: Malinche, meaning a lover of foreigners. La Malinche was the beautiful and supposedly traitorous Indian mistress of Spanish conquistador Hernan Cortes, who overthrew the Aztec empire and won Mexico for Spain in the 16th Century. In Mexico, to be called a malinchista is to be called a lover of foreigners – a wannabe American or European. Juan Carlos Araujo, a Mexican theater critic, says tensions within the Mexican theater world over foreign productions and actors have been long simmering. "We should favor the best talent possible. But we should strive for strengthening the Mexican theater industry. We tend to look outside our frontiers for talent for plays, for new productions, when we have incredible talent here," he said. These kinds of tensions over casting and cultural identity also exist in the American theater world. The Broadway hit musical Hamilton challenged conventions by purposefully having black and minority actors play the roles of America's mostly white founding fathers. Villegas, who organized the Metropolitan Theatrical Awards in Mexico, says he understands the frustrations of Mexican actors who lose out roles to foreigners. "But at the same time, we do the same in New York and Madrid," he said. "And my response has always been why don't we treat them the same way that we would like to be treated when we travel abroad and when we find success in other cities, like we do."